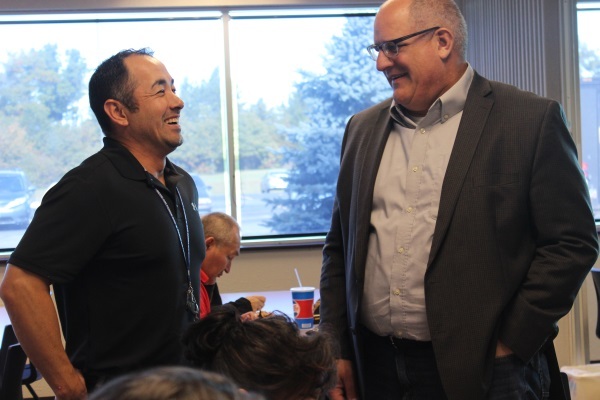 In an effort to reach out to all tribes in the state, Wisconsin Department of Veterans Affairs Secretary Daniel Zimmerman visited the Ho-Chunk Nation Tribal Office Building on Thursday, October 4. A meal was provided to him and all veterans. He also took a brief tour of the Nation’s buildings and grounds. “My purpose was to get out and better understand what is going on in the tribes and what they are their concerns are relating to veterans. It’s one thing to have your folks report back to you and let you know what’s going on and it’s another thing to actually experience it firsthand,” Zimmerman said. “One of the things we were taught early on in our military careers is that those in charge need to be right there on the ground. I apply that same kind of concept to my duties as secretary,” he said. He and Tribal Agency Liaison Shaun Stoeger visited all 11 tribes over a two-week period. “It was a very enlightening and interesting experience for me – very valuable,” Zimmerman said. He said that every tribe has a very unique flavor and there are some things that are common. Some of the common things are an incredible respect for those who have served our nation. “I wish I could transport that respect to other parts of the state. It’s very heart-warming to see that,” Zimmerman said. Each tribe has different concerns, some good and some bad. Some tribes are concerned about how far north they are and how close to populated areas, and some have contiguous land while others have land that is interspersed with private land. There are some good things and there are some challenges, he said. He and several Ho-Chunk Nation officials, along with Traditional Chief Clayton Winneshiek, toured the Sandpillow, Mission, and Wazee areas. One of the main stops was the veterans housing facility in Sandpillow. The tour concluded with a visit to the Powwow Grounds. Following the tour, Zimmerman and Stoeger held a question-and-answer listening session in the Legislative Conference Room. A native of New Berlin, Zimmerman now lives in Ripon. He spent his 25-years military career serving in various command and staff positions in support of the tactical Army worldwide. His experience includes numerous training-related assignments at three of the Army’s premier combat training centers. Since his retirement from the U.S. Army in 2008, Secretary Zimmerman remained engaged with the military and educational communities. Zimmerman was appointed by Gov. Scott Walker to serve as the 10th Secretary of the Wisconsin Department of Veterans Affairs.